Injuries such as sprains and dislocations, bruises, blood and joint effusions, inflammatory and degenerative processes associated with inflammation on musculoskeletal disorders (eg, tendons - bursitis), arthrosis of the hip, knee and small joints. 100 g bevat: Arnica montana D4 1.5g, 0.45g Calendula officinalis D4, D4 Chamomilla 0.15g, 0.10ml Symphytum officinale D8; Bellis D4 0.10g; Hypericum perforatum 6X 0.09g, 0.09g Millefolium D4, D12 Mercurius solubilis 0.04g. Human hoemephatisches means that is also suitable for small and large pets. Unless otherwise prescribed, morning and evening, more often if needed, to the affected area (also abrasions) apply, where appropriate, ointment dressing. 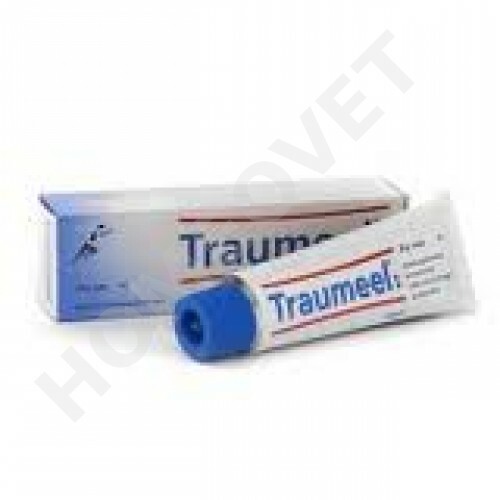 A large-scale application of TraumeelS ointment should be avoided.